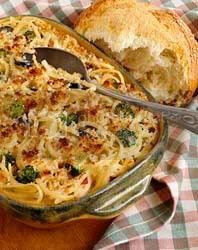 Just in time for "what to do, what to do" with that standard leftover turkey carcass, here's an ideal step-by-step recipe from the good people at Holiday Kitchen.TV for one of my day-after-the-holiday favorites, Turkey Tetrazzini. Just in time for the Thanksgiving holiday "stuff fest," the perfect opportunity to learn how to pair your holiday bird with wine comes with Natalie MacLean’s easy-to-use tool for pairing the right wine with the right meal. With her Wine And Food Matcher, you can search by wine if you're looking for meal inspirations (including recipes) or search by food to find great wine suggestions. 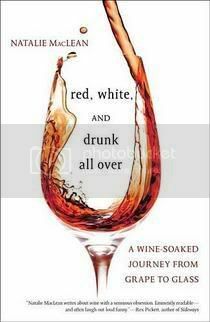 Red, White and Drunk All Over: A Wine-Soaked Journey From Grape To Glass, she explores food and wine matching further, with each glass representing a personal history. Filled with entertaining wine facts and quick-witted anecdotes, with a section of the book devoted to different shapes of wine drinking glassware she reminds us all that "life is too short to drink good wine out of bad glasses." Words to live by, no doubt. Pinot Noir: An aromatic red wine that adds its own unique appeal. Generally light in body, with soft texture as a counterpoint to its lovely aroma, Pinot Noir is easy to love, especially among the many flavors of Thanksgiving. Beaujolais Nouveau: Every year in November, the first wine of the harvest in the Beaujolais region in France makes its way to market. This wine is as fresh and appealing as its name, made from the Gamay grape, fresh, purple -- and no pretension. It totally complements Thanksgiving and can be enjoyed slightly chilled. It’s also likely to please those who favor white wines as well. In any case, those great innovators who gave us the Shopping Bag Bra and the ever-toasty, microwaveable Warm Biz Bra, have now come up with a new way to save the planet and enhance your "boobage" -- the "Chopstick" bra. Lingerie maker Triumph International Japan unveiled the My Chopsticks Bra on Wednesday in Tokyo in a bid to promote the use of reusable chopsticks instead of disposable ones. This eco-friendly concept bra, which comes with a pair of collapsible chopsticks, is equipped with a Japanese dining table theme. The right cup consists of a rice bowl, and the left cup a miso soup bowl. A removable chopstick-rest lies between the cups. Oh, and get this: Holsters made of cloth and placed on the sides of the cups actually hold the chopsticks -- while pushing the breasts to create cleavage. What else can one say, but thanks for the er...mammaries. Which also begs the question: What's next? A "Salad Spinner" in my bikini briefs?? 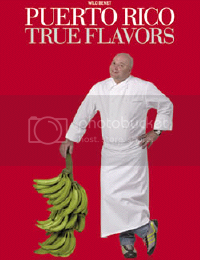 On the heels of his success with his two flagship Museum restaurants in Puerto Rico, his first cookbook offering is titled Puerto Rico True Flavors, and it's the culmination of Wilo Benet and his mastery of Puerto Rican cooking, his expertise in preparation, creativity, and finely-honed skills. Merging the tastes he grew up with, from his mother's "from-scratch" cooking, his grandmother's well-loved recipes, lunchtimes at public school, street vendors' fritters and roasted chickens, and all the other everyday-food influences of Puerto Rico, together with his exceptional culinary talents, he brings those historic true flavors of the Island into the 21st century. Learn how to make authentic Basics (adobo, escabache, mojito); Fritters (alcapurrias/stuffed yautía, bacalaítos/salt cod fritters); Soups such as sancocho/root vegetable & beef; Meats like carne mechada/stuffed pot roast; Fish (camarones al ajillo/shrimp in garlic sauce); Plantains (amarillos/sweet plantains, arañitas /plantain spiders); and Desserts (flan/custard pudding, dulce de lechosa/candied papaya), to name just a few of each. From the Adobo based rubs and achiote seed oils, to the artfully completed recipes and methods, this book is another one of my picks for a must-have for any cookbook shelf.